So far packing of brochures and other stackable products into telescope type cartons was a completely manual process with high physical work load: lifting the heavy piles into the bottom part of the box and hand injuries during filling from the sharp edges of the cardboard boxes. 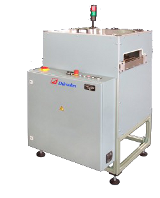 With the new packing systems for telescope cartons this process can be streamlined and facilitated for different needs. In this way the only disadvantage of this eco-friendly, convenient and well priced packaging is eliminated. 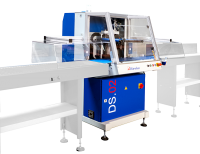 For small and medium runs and lower use of telescope cartons turning unit Dürselen DS.02 allows in-line packing by hand at high output and without physical stress. For large runs and constantly high use of telescope cartons packing system Dürselen VA.02 offers a fully automated solution. It can run in-line with upstream and downstream machines like e.g. brochure production lines and palletizing systems. The new suspension track system is an ideal complement for automated packing system VA.02 for packing in telescope type boxes.